Today’s episode of the Dr. Momma Says Podcast occurred very spontaneously, and that is HUGE for me! I like to plan topics in advance, but when I learned about the JUUL (a popular e-cigarette) and the impact of vaping on kids, I just had to get my thoughts out immediately. Products that contain hazardous nicotine impact everyone, but are especially harmful to young kids! JUUL is the most popular e-cigarette. It is shaped to look like a USB drive, releases less smoke than other brands and has options to decorate them with colorful skins. Additionally, instead of pouring a liquid into a chamber, the JUUL has replaceable flavored pods…with names like Cool Cucumber, Mango, Creme Brulee, and Fruit Medley! These names encourage kids to consider the pods to be safe. Oh my goodness. Check out this YouTube review of a JUUL pod called CoCo Mint. Can you imagine what your teenager would be thinking while watching this? Notice how he did not mention that they were vaping nicotine! What is the difference between tobacco and nicotine? Tobacco is a plant that contains nicotine. When it is smoked, nicotine leads to addiction, but the other harmful effects occur because of inhaling smoke. We understand the risks of tobacco in cigarettes, but children and parents both need more education about e-cigarettes and vaping. Vaping nicotine is an increasingly popular activity, but many people do not fully understand that nicotine is still nicotine. Changing the delivery system does not change the chemical because the nicotine used in e-cigarettes comes from tobacco leaves! 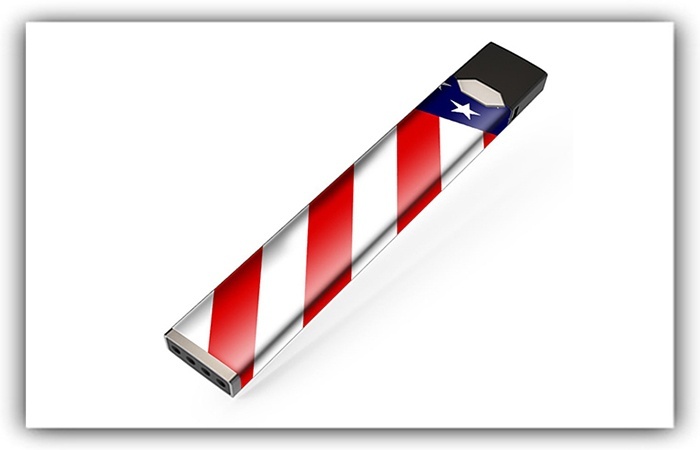 Nevertheless, e-cigarettes (including JUUL) are often considered tobacco-free. Tobacco products are highly regulated by the government for health purposes; however few regulations in the United States exist for vaping. Scientists and physicians aim to change that to avoid preventable health problems. Both adults and kids incorrectly think that vaping is safe because you inhale and exhale vapor, not smoke like in regular cigarettes. But there are harmful chemicals in the vapor. Long ago, regular cigarettes were found in vending machines in restaurants and stores; therefore, people did not realize the dangers associated with smoking. Now, e-cigarettes are sold in convenience stores while vaping and hookah stores are found in many shopping plazas and malls. Just because they are easy to find and purchase does not make them safe! Many years of research has clearly shown the dangers of smoking tobacco; however, because e-cigarettes are new, they have only been studied for a few years. Basic information about the difference between e-cigarettes and regular tobacco cigarettes can be found here. Recently, at the Georgia Chapter of the American Academy of Pediatrics meeting, Dr. Susan Walley, a pediatrician from the University of Alabama at Birmingham gave an incredible lecture. This presentation moved me to rush home and record a podcast about it. One JUUL pod contains as much nicotine as one pack of cigarettes! Second-hand vape smoke contains nicotine PLUS other toxic chemicals. Cigarette smoking has decreased over the years but now a new generation is becoming addicted to nicotine. There is a lot of misinformation about e-cigarettes, but it is important to understand the 5 Truths You Need to Know About Vaping. Physicians are working hard to lead the charge in educating people about the dangers of vaping. Dr. Kristen Stuppy, an extremely active social media pediatrician. has written a comprehensive post detailing the concerns of vaping in children and Dr. Jill Grimes, a well-known family physician has detailed her concerns about how JUUL is not cool! And be sure to check out this post by a psychiatrist who addresses the impact of JUUL addiction on our teens. If you want to sample the information I received during the meeting which led me to create this podcast, check out Dr. Walley on YouTube with her presentation about vaping and e-cigarettes. It’s an hour so grab your coffee or tea, and get ready to learn. Because of research linking hazards of e-cigarettes in kids, the manufacturers of JUUL have stopped their targeting of underage children by discontinuing the sale of their flavored pods with enticing food and candy names. This is a victory of public health workers everywhere! As always, much love for supporting my work. I intend to launch new episodes every week, but may periodically produce bonus episodes. So, be sure to subscribe to the FREE podcast on iTunes or subscribe to my blog to be notified. You KNOW you do not want to miss an episode! Also, you may reach out to me on the contact page to send comments, show topics or questions. You can also send requests to be a future guest, work with me, or sponsor an episode! Interestingly, my son is trying to quit smoking, so he bought a vape. Unfortunately, now he smokes AND vapes. He went to his doctor for Champex (sp?) but still intends to vape afterwards. I had no issue with it if it would get him off cigarettes, and he was using a low-nicotine liquid, then weaning off it (as had been the plan) but I’m not happy that it’s going to replace cigarettes. Thanks so much for sharing, I’m sending this to him! Your son is a true example of how vaping is not helping to wean off nicotine but it provides a different way to get it and allows you to use your vape in areas that are non-smoking. Overall, vaping has not been shown to be effective in helping people quit smoking. Wishing him the best! It’s sad that in a world with so many aggressive adverts against cigarettes and nicotine, teens still think it’s cool to smoke or vape. I am happy that my country has declared that wants to be smoking free by 2023. Teens and many adults do not know vaping is dangerous or that it makes you more likely to start smoking cigarettes. Hoping research will allow us to lump vaping into the same category as smoking. It worries me that vaping products aren’t really regulated over here and not much is known about them. The Vaping Shops are all over the high street and I sort of wonder if in 50 years time we will see them in the same way as normal cigarettes and the shops will be reminiscent off old snuff ones. The scientific community is working hard to get the research to prevent unnecessary deaths and diseases in people who were unaware of the consequences of vaping. Hopefully, tighter regulations will be happening soon. So true! I hate that so many kids are doing this. I tell mine how gross it is. I know the flavors are supposed to be good, but it still reeks to me. The marketing has become so deceptive that kids truly do not think it has risks or could be addictive. Most ads do not even say the word nicotine. I really thought that was a USB when I saw the photo at first. My husband is using a vape ( not this brand) to help quit smoking, and for that purpose it has been working.. I totally agree that it isn’t supposed to be for kids, and does have terrible side effects! I was shocked to see that there were colorful skins to make these look enticing to kids. Adults can try to quit because they can monitor to use lower amounts of nicotine in their e-cigarettes. Kids are using high nicotine products and getting more addicted. Any kind off smoking is very harmful for kids, be it even an e-cigarette, this is a very informative post. One shouldn’t smoke in front of kids. Yes, smoking or vaping in front of kids is bad. The most needed info of the decade. All the thanks to you. Love this. I agree. We need to stop vaping from becoming an epidemic which could threaten many lives. Smoking or vaping… both a no-no for me. I wouldn’t want to stand near someone smoking or vaping nor my little nephews to be near them. We need to keep this next generation of kids from becoming addicted. I always thought e-cigarettes is safer but I guess I am wrong. This page has give me a lot of knowledge. Many people think they are safe but they are dangerous and extremely addictive. A very informative post. The e-cigarettes and vape smoke have always scared me! So many toxins. Many people do not realize there are many toxins as well as nicotine. There are real dangers to vaping. The more this can be shared the better it is for public health. But isn’t real cigarette smoke even worse? Real cigarettes are extremely dangerous and decades of research shows this. Vaping has only a few years of research and it looks very concerning. Hopefully regulations can prevent addiction and other bad health problems. FDA is investigating these vaping companies. It’s high time that this happened. This is poison for kids and adults. Yes, more research is occurring which will be helpful for the US government to establish regulation. Fingers crossed. I’ve always wondered about e-cigarettes and their effects. My brother uses them and swears they’re super safe and that it’s so much healthier than smoking cigarettes. I always thought that seemed incorrect as there is still nicotine in vaping. Initially, e-cigarettes were designed to help smokers quit, but there are also options to get nicotine amounts to add that have the same or more nicotine than regular cigarettes. The studies are showing that most people are not successful at quitting by vaping. This was so very interesting. I never would think that vaping would be safe for kids. If there are any parents out there that think that nicotine in any sort of delivery is safe for kids, then they need a reality check. Sadly, marketing companies mislead about how much nicotine is in e-cigarettes or even the fact that vaping can become addictive. I have heard a wee bit about e-cigarettes. I am totally ignorant about benefits or risks as I have never smoked. I see hookah and vaping places everywhere so it has become entrenched in our society. Chances are you know people who vape but they may not understand the risks. This post is so full of information, there is not much vapping in australia but i can see how this can get very popular, I wonder if the same legislation on smoking would apply to vapping? I can see how people would think that this is ok, but yes it can be dangerous for the young lungs! Unfortunately not! New legislation will have to be made as more research and information is determined about vaping. Smoking has different dangers but vaping as serious risks, which includes a HUGE chance of become an addicted smoker. I didn’t know about Juul thanks for sharing . Luckily in my family nobody is cigarette smokers. Both I and hubby are non-smokers. Yes I am also grateful none of my immediate or extended family members smoke or vape. But this is a potential public health threat. Wow I knew that Nicotine was bad for health but never knew the causes behind it.. This was an interesting read to know a lot about the causes behind Vaping Nicotine… I would definitely share this post with my friends and family…. Great to hear. We need to spread the word about this dangerous trend. Whats it say about our culture that more and more cartoony and colorful products are made for adults as well as kids. Kids will obviously gravitate to them, but its just as common that adults do as well. Colorful things that resemble food seem less threatening and allow people to buy them with less concern. Marketing can hide the truth. I agree! When I first saw that video my jaw dropped. Parents need to know how kids are being recruited to a new addiction. My Dad tried using vape before so he can quit smoking but it didn’t work out. He is still smoking cigarette now but due to some circumstances, it will soon be stopped. Yes, it was initially thought to be a good way to quit smoking but that fails for most people. It is suggested to use other approved ways because the goal is to decrease the addiction and not just substitute for a new one. My daughter just turned 18 and uses this Juul thing. I smoked her whole life as have her grandparents. Her Nana is dying from COPd, emphysema and asthma right now. I try to explain the harm to her, but she doesn’t want to hear it. I’ve shown her the photos of popcorn lung, cancer and everything but no such luck. Any suggestions. Thank you for this information. This is useful. Thank you for sharing. So glad you find this informative and helpful. Thanks for reading.